Mark Warner, high-tech entrepreneur and former Virginia Governor, visited the online virtual gaming world, Second Life, yesterday (August 31, 2006). 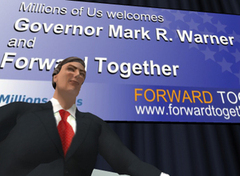 Mark Warner appeared as the Mark Warner avatar as shown to the right to speak to a number of other avatars that were attending the virtual world event. A full transcript of the event can be found here. It is the first known use of an online virtual world gaming by a political figure. It appears Mark Warner is planning to make additional Second Life appearances like a town hall style meeting as he is currently a potential Democratic Presidential candidate in the 2008 election. Look out Hillary! It is great to see a politician using cutting edge technology to communicate. He appears to be getting some wonderful guidance. I expect to see others following Mark Warner's lead but kudos to Mark for being the first - maybe it will win him a Democratic nomination?